Tour the Atlanta headquarters of America's first all-news television network, CNN, on this 50-minute guided walking tour. Watch news feeds from CNN bureaus worldwide and peer inside CNN's high-tech special effects studio. Learn how a live news broadcast is produced and broadcasted to millions of viewers worldwide, and watch correspondents and producers hard at work putting together CNN's around-the-clock news stories. You can even get a souvenir photo of you behind an anchor desk! Present your voucher at the tour box office at the base of the escalator and receive your timed ticket for your journey into the heart of CNN's headquarters. On the Inside CNN Studio Tour, you'll get an up-close, in-depth look at the pioneer of the 24-hour television news format. 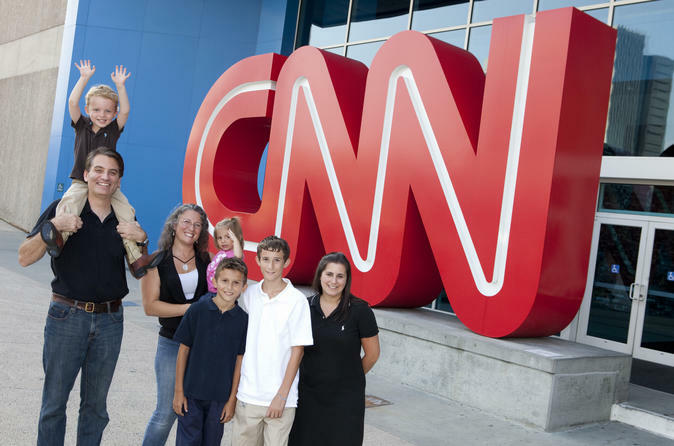 The studio tour is an approximately 50-minute guided walking tour that provides a view into the newsrooms and studios to see firsthand how CNN gathers and reports the news. Learn about CNN's history from your informative guide and visit a control room theater, where you'll learn all about how news broadcasts are put together. Next, head inside a special effects studio to see how weather maps and on-air graphics are created. Watch live news feeds, see journalists at work in the main CNN newsroom, and maybe even see newscasters broadcasting live. Don't miss the chance to get a souvenir photo of you behind an anchor desk! Before or after your tour, explore the many shops and restaurants at CNN's massive headquarters. With tours running approximately every 10 minutes throughout the day, this fun, educational tour is easy to fit into your schedule and ideal for the whole family!